I really enjoyed watching Rick Stein’s most recent series, ‘Rick Stein’s India’, and I got totally caught up in the colors and vibrancy of Indian cooking. Despite this, the dry curry was a recipe I was ready to be disappointed by. The list of ingredients is extremely short and simple, and the main ingredient is cabbage – it couldn’t possibly pack the flavor punch usually expected from Indian food. I was wrong. Simple it is, but don’t let that fool you. Mustard seeds, curry leaves and turmeric are all you need to turn a dull head of cabbage into a tasty and satisfying meal. I added garlic – which is probably treasonous, but I’m ok with that – and that rounded out everything really nicely for me. Because I couldn’t find a fresh coconut, or frozen flesh, I used dried coconut pieces (not the grated kind) and rehydrated it in boiling water. It was a bit chewy, but that’s just texture right? This curry delivers, and besides that it’s so economical and quick to make! 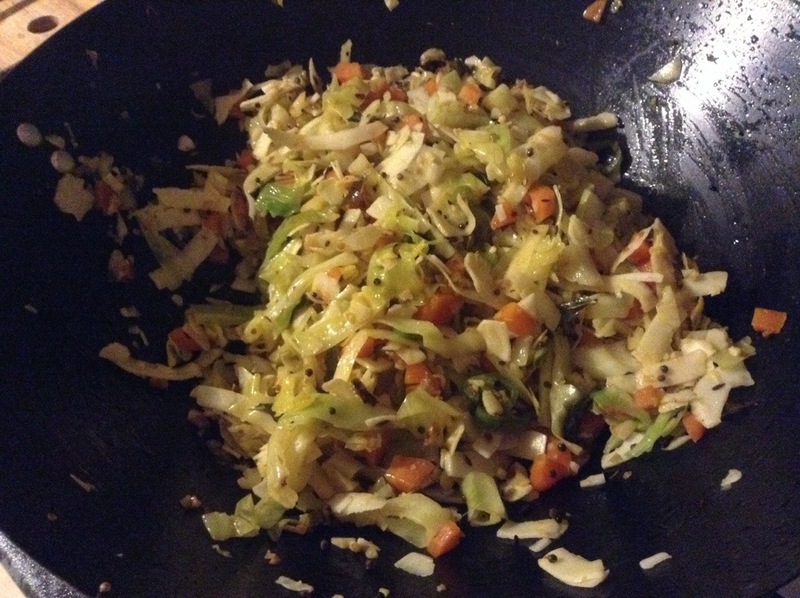 Cabbage, a carrot and some coconut, 10 minutes in a wok and you’ve got dinner. We didn’t bother having rice with it, but I think the mango chutney really lifts the cabbage and brings out the freshness of the ingredients. So next time you feel like a veggie dinner, try this. I will never doubt Rick Stein again. What a coincidence! I only recently discovered Thoran, and made one yesterday: beets, spices, coconut. It might sound weird, and I had doubts as to the result, but I wanted something that wasn’t roasted beet salad or borsch. Well, it was fantastic! Now I am very curious about your cabbage Thoran, I will definitely try it out at some point during the cold season! It sounds like it shouldn’t work, but it does! Are you going to post beet one? That sounds great! Earlier this year my husband and I toured Ireland with a Rick Steves group. Our guide told us funny stories about how in the early years when Rick Steves was first in Ireland doing tours, that everyone thought the guide was saying Rick Stein. It doesn’t really sound funny now, but the stories were hysterical. Anyway, this is the first time I’m reminded of Rick Stein. I’m going to have to look into him more. Fascinating recipe. I will give this a shot. I’m skeptical as well, but I believe you. I just picked up some curry leaves and mustard seeds. It’ll be a change up from the usual. Cool recipe. Thanks for sharing. Cabbage is too often denigrated, and your recipe shows what a versitle vegetable it is – especially with an Indian twist. I love cabbage, but even I was surprised how well it worked in this. Thanks for following! 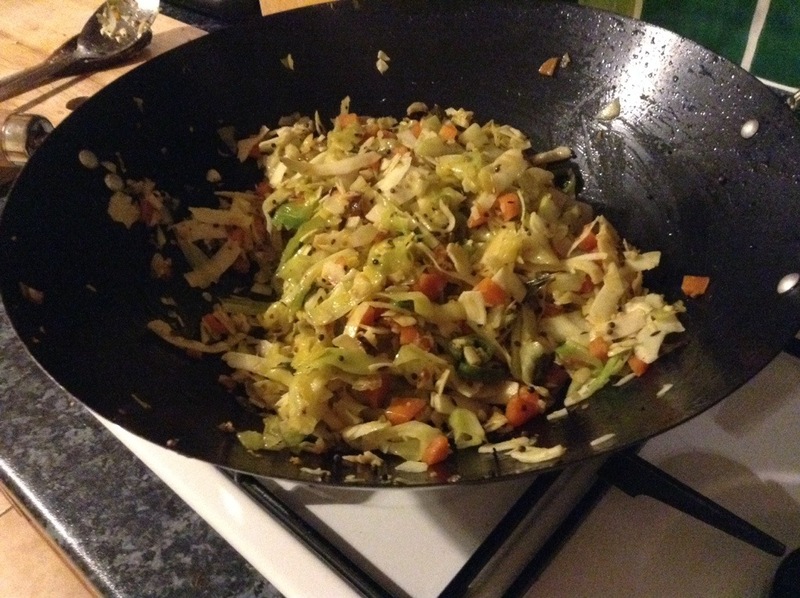 I don’t know why I never though of an Indian-style stir fry before, but it really works!